It is time for new version of my program ShixxNOTE. There are lot of changes (autodetect URL in note text, transparency, etc.) and few bug fixes in program which you will be able to see on page "What's new" on program home page. Default ShixxNOTE language is English new version will be localized on German, Spanish and Italian language. New program version ShixxNOTE 7.net will work on any Windows platform. It doesn't need any framework or runtime so you can install program on old Windows 95 or new Windows 7. Still program is written in C++ and because of that it is quick, small and neat. It is client/server application so you have to enable in your Firewall program default ShixxNOTE program port "2000" or just click on button "Allow access" on dialog which appears on first program start on Windows 7. You have to do that if you want program to work properly in your LAN (sending and receiving notes). Because one program thread is listening on default port for received note data. In new version there is new function for reading your network (LAN) at program startup and it is faster then previous one. 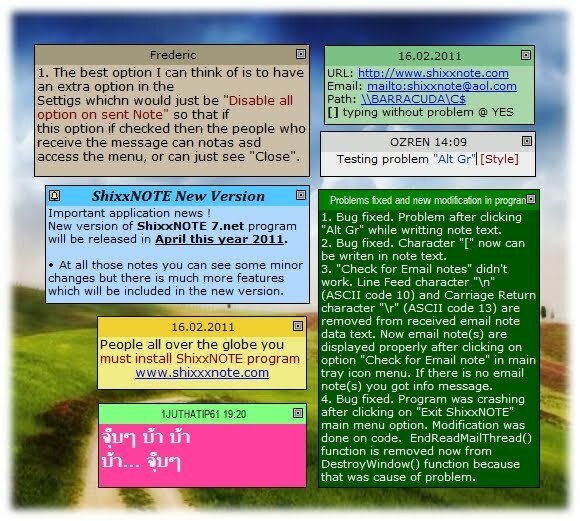 New version release will be available for download in December 2012. Every potential customer who register current ShixxNOTE 6.net program version till December 2012 will get new stable version of ShixxNOTE 7.net and a license bonus for the same price. That means, if you now register for example ShixxNOTE 6.net 5-Users License which costs $24.95, in December 2012 you will get registered ShixxNOTE 7.net 10-Users License version, because you have license bonus. So register now current program release and get license bonus for new version which will be released in December, 2012. This version is quite good. Option that helps disable such stuff so useful. I wanted to figure out., do you have only trial version? I am author and developer of ShixxNOTE program. So you can download trial version of program from more than 1000 sites, but I advise you to download trial program version from my official program site www.shixxnote.com. That is 30-days trial version with all functionality. After that you must register program also on program home page site on "Order now" section. Just click on "Buy now" button and after you pay, you will get download link and/or CD backup with registered ShixxNOTE version.